Hi, I've followed the thread https://forum.stockmanagementlabs.com/d/431-multiple-warehouses-what-s-the-intended-way-to-manage-this/ with interest. Show an amalgamation of stock quantity from two or more warehouses in the shop (eg show stock from all warehouses located in the UK) - in the other apps I've reviewed, this is usually done at shop level, so one universal setting would suffice where the admin can tick which warehouses to use for stock quantity. 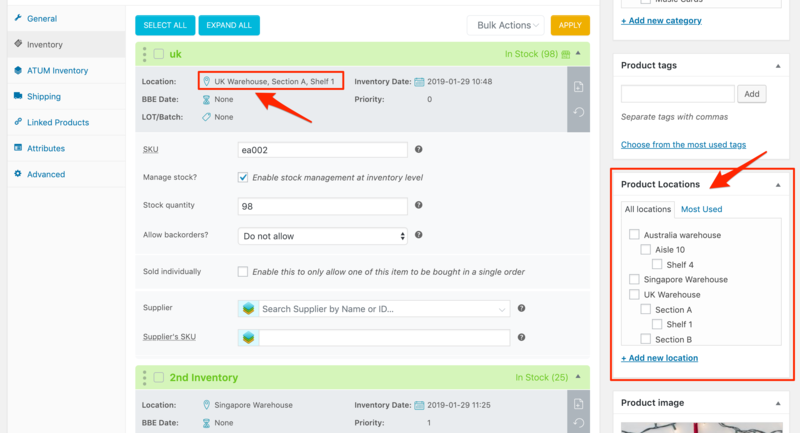 Create a form for stock transfer between locations where stock is moved from A to B (however, inventory logs appear to offer a workaround, so not essential). 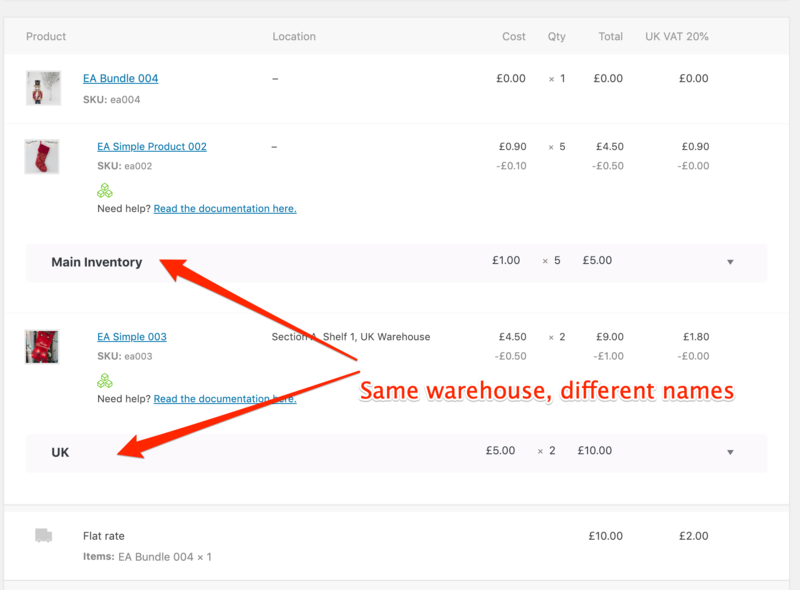 One observation during our testing: If an inventory has a different name it shows separate on the order form even if the warehouse location is the same. That doesn't make sense, like the other poster I'm struggling with "inventory name". It would be easier if "inventory name" = "warehouse name / location". The concept of a separate inventory name is confusing; and is likely to lead to human error (not following naming conventions, resulting in different names for same warehouse). See screenshot. Lastly looking ahead the client is likely to need a multisite set up. Multisite & WooCommerce don't share stock inventory. If you can offer a solution that allows a central stock management for all sites within the network, it would solve so many problems. Query - how is product location on the right hand menu meant to be used when Multi Inventory is active? The two appear to duplicate each other? 1. you can edit the order and pick a different inventory already. 2. you can do that too when you edit the order simply add one more inventory and reduce the other. 3. and 4. will be part of Warehouse premium add-on due to go out 2020. 5. we wanted to give users flexibility as the names do not have to represent different locations. However, as you are not the only one with this problem, we have already decided to add an option to auto-naming according to warehousing. It will come in future updates. 7. this is a bug and we will fix it in the next updates - apologies. Many thanks for the quick reply! All understood and seriously looking forward a multi-channel / cloud service. Re: "1. you can edit the order and pick a different inventory already." I can see now how that works. One issue - when an order changes from "pending payment" to "processing" it triggers the order confirmation email to the client. Only workaround is to go straight to "completed" and trigger the completion email instead. Not ideal, but I can see that you're using the standard Woo process here so not sure what can be done about it. Re "2. you can do that too when you edit the order simply add one more inventory and reduce the other." Sorry, I meant to split an order to fulfil separately (eg if 1 item is out of stock, but the others are ready to ship). I can see that's not part of your plugin, I will check out "split order" solutions separately. Yes, exactly, we do try to keep with WooCommerce process if possible. Please, correct me if I am wrong, but the order confirmation email that triggers after the change to processing has in my opinion no impact on what you want to do. You can still edit the inventory. This kind of order management is not what we are after. In case of WooCommerce introduces this action in its free version, we will make sure all our add-ons are compatible.